Efficiency, Continuous Improvement, Commitment, Quality… are our reason for being, values that motivate us and are present in all our products, services and processes. In addition to having ISO 9001:2008 Quality Certification, Grafilur has ISO 14001:2004 Environmental Certification and is certified by the FSC® (Forest Stewardship Council®) and PEFC™ (Programme for the Endorsement of Forest Certification™) forest certification schemes, which guarantee that we work under the most stringent quality standards and that we manage our resources according to forest sustainability criteria. 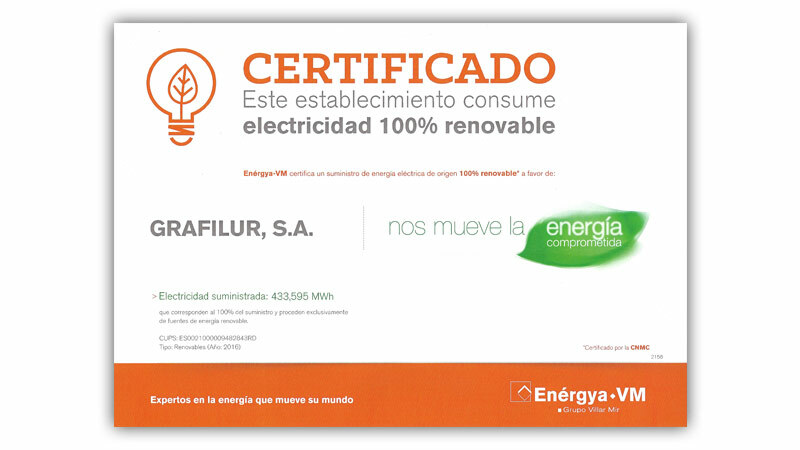 In our quest to make progress in environmental protection, we also call on our suppliers to make a proper commitment to nature and the sustainable environment and, as proof of this, we have received the 100% Renewable Power Supply Certificate, certified by our electricity supplier and the CNMC (Comisión Nacional de los Mercados y la Competencia – National Market and Competition Commission), which ensures that the energy we use is only generated from trusted sources and delivered transparently.